Blackwood is the swampland east of Leyawiin along the Trans-Niben, adjacent to the Black Marsh border. The waters from this swamp drain south into Topal Bay. 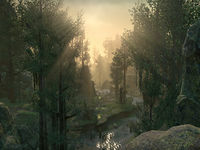 Blackwood also shares many common traits with the Imperial Province of Black Marsh, such as climate, geography, and wildlife, due to it being directly adjacent to the province. Located along the Green Road is the headquarters of the Knights of the White Stallion, a knightly chivalric order chartered by the Count of Leyawiin. The land to the west of the Lower Niben was ceded to Cyrodiil by Elsweyr in an agreement between the Count of Leyawiin and the Mane just prior to 3E 432, following a long-running dispute over the border. This page was last modified on 21 May 2016, at 15:02.